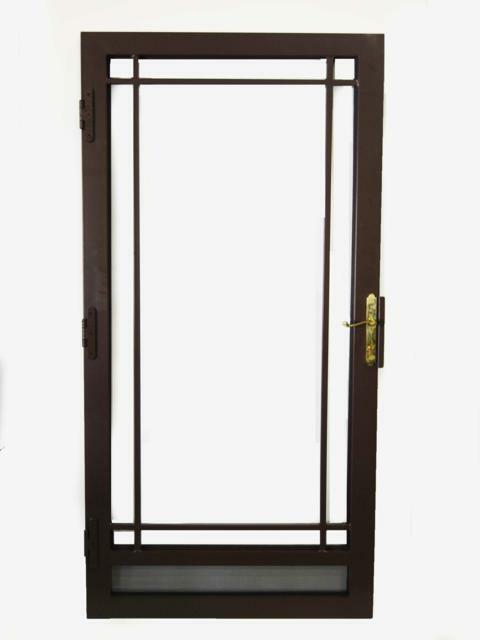 Secure Breeze Security Storm Doors can be built in any size single, double, sidelight or transoms. The door shown was built for a customer who only wanted the screen/glass panel in the bottom of the door. You can put in the screen panel when you want a little ventilation or put in the tempered glass panel when it is cold out and you want the insulation. Our solid brass DSL locks come in Polished Brass and Satin Nickle or you can get the High Security PSL with a full 1" deadbolt in Polished Brass, Antique Brass, Satin Nickle, Satin Chrome, Oil Rubbed Bronze and Tuscan Oil Rubbed Bronze finishes. You can select from 10 stylish powder coated colors for your custom made door for your home. The 1/4" laminated glass provides protection without the look of bars. Feel secure in your home with your new Secure Breeze Security Door. You can see the demonstration video on our website or go to http://www.YouTube.com/wtndoor.com where you can see the performance of our Secure View or Secure Breeze Laminated Glass Security Storm Doors. The laminated glass also eliminates up to 99% of the UV ray infiltration and has sound deadening qualities. Our high security locks are available in Polished Brass, Antique Brass, Satin Nickle, Satin Chrome, Oil Rubbed Bronze and Tuscan Oil Rubbed Bronze finishes. You can select from 10 stylish powder coated colors on your custom made door for your home. The 1/4" laminated glass provides protection without the look of bars. Feel secure in your home with your new Secure View Security Door. You can see the demonstration video on our website or go to http//www.YouTube.com/wtndoor.com where you can see the performance of our Secure View or Secure Breeze Laminated Glass Security Storm Doors. The laminated glass also eliminates up to 99% of the UV ray infiltration and has sound deadening qualities. Available in 28 days.